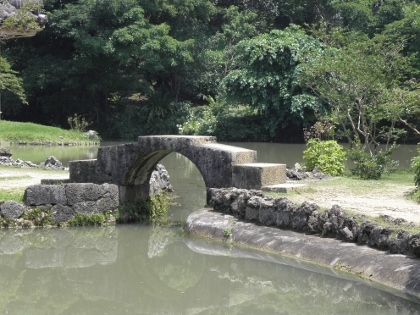 The Gusuku Sites and Related Properties of the Kingdom of Ryukyu are a group of 9 stone monuments and archeological sites on the island of Okinawa. They are the remains of the ancient Ryukyu kingdom, which flourished between 1429 and 1609. 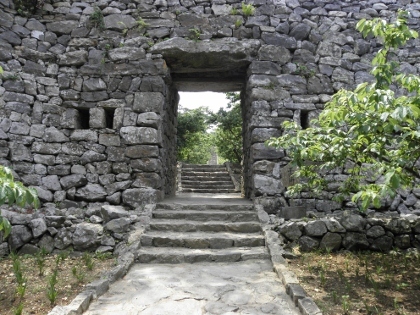 The “Gusuku” were walled compounds, which over the 12th to 16th centuries evolved into forts and castles of local chieftains. They were both political and religious centres. Some are still used for traditional religious rituals such as nature worship. The unique Ryukyu culture was heavily influenced by the economic and cultural interchange with Japan, China, Korea and Southeast Asia. Okinawa sees 3.8 million visitors yearly, but not many of them are foreign tourists. In our ranking of visited WHS this one is at the lower end, sharing its 8 visits with rather remote locations such as Manu National Park in Peru and Konya-Urgench in Turkmenistan. If you've made it all the way to Okinawa, the inscribed sites are quite easy to visit. Four of them are located in the capital Naha. That's were I started too. The main location is Shuri, the former inland capital which has now been merged with the port city of Naha. Shuri holds 3 out of the 9 WHS locations. Shuri Castle is the main attraction of whole Okinawa, and I encountered lots of school groups there. Here a Gusuku has been fully restored / rebuilt, which gives you an idea how it functioned. The Sonohyan-utaki stone gate is located in the same complex, and is a strangely mysterious religious site. I was quite captivated by the thought of praying to a stone gate instead of the sacred grove that formerly lay behind it. Finally, the royal mausoleum Tama-u-dun is a 5 minute walk away. The doors to the burial chambers are for ever closed too. What remains is an austere monument, with three sculptured lions located at pedestals guarding over it. In a different part of Naha lies Shikinaen, a garden villa and Chinese landscape garden. It's a very serene place (the crowds will not get here), and worth a half an hour stroll. I can also recommend to walk into the street next to the garden, where the traditional ceremonial gate and common gate that lead into the gardens can be seen. These are typical of Ryukyan architecture, with stone carved as if it was wood. The Gusuku are spread all over the island, and the last one I visited is located in the north: Nakijin Castle. Only ruins of the castle are left, long lines of stone walls hinting at the lay-out of this former local religious and political centre. This is a very atmospheric site, located on a hilltop and with views all over the surrounding forests. There are a lot of flowers, and it just smells very nice! Large colorful butterflies are attracted by that too. Okinawa has traditionally been culturally and linguistically separate from Japan. It wasn't until the late 19th-century that Okinawa became part of the Japanese Empire. That history is reflected in the structures of this world heritage site. The nine sites which are included in this property all harken back to before it was absorbed into Japan. I've often said that the Ryukyu Islands are Japan's Hawaii. A chain of islands annexed in the 19th-century with their own culture, and now people go there for warm weather vacations. Read more about the Gusuku Sites and Related Properties of the Kingdom of Ryukyu on my website. I went to Okinawa in February 2016 on a whim after seeing ads for a flat £60 tourist fare for any domestic Japan flight. We were on a weeklong trip seeing the WHSs of mainland Japan, but I thought it'd make a nice break to fly to Naha for the day and see the 4 subcomponents situated in the city. Naha is served by a single monorail line that connects its airport, at one end of the line, to Shuri Castle, at the other. 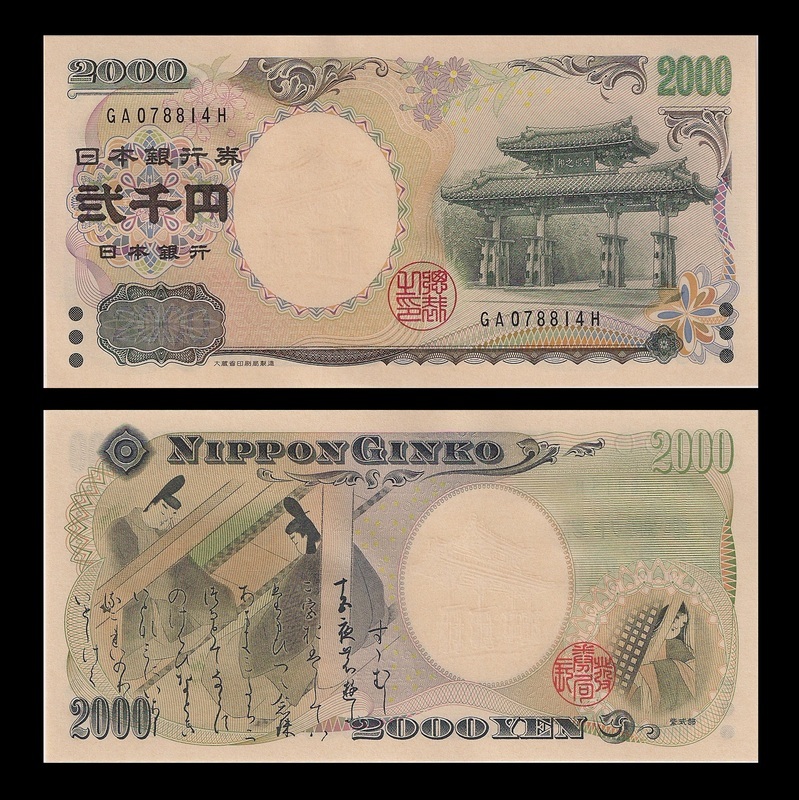 It is 820 yen at time of writing, and the largest of the Naha Ryukyu sites. It was completely destroyed in the fierce WWII Battle of Okinawa when the Japanese used it as a defensive position. The castle was rebuilt in the 1990s from historical records, as faithfully as possible. Next to the castle is another WHS subcomponent, in the form of a gate protecting a sacred grove of trees (free to see). 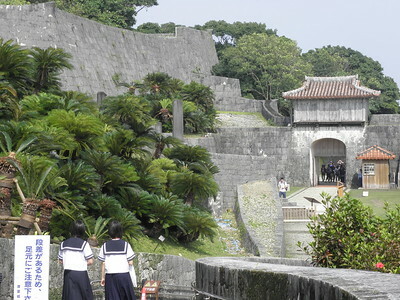 The gate, known as Sonohyan-utaki Ishimon, used to be opened only for the king. There being no Ryukyuan king these days, it is never opened any more. Just a few metres down the road is the third subcomponent – a mausoleum called Tamaudan. 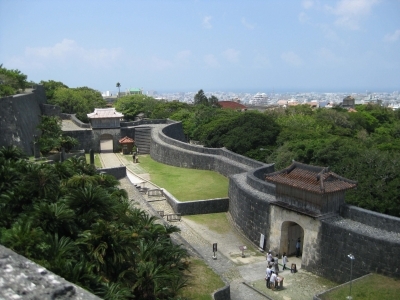 It consists of two stone-walled enclosures, and was the burial site of Ryukyu kings and queens. It costs a nominal 300 yen to get into, and although there is not much to see the guest centre does have a small information room. The final Ryukyuan site for us was to be the royal garden of Skininaen (400 yen). Whilst still within Naha city, this necessitated a walk of perhaps 45 minutes across town. Using the free GPS function on Google Maps I was able to navigate us down charming back-streets in Naha’s quiet suburbs. We saw turtles basking in the sun and enjoyed walking amongst the trees and seeing the views afforded by the park’s elevated position. Okinawa is one of the most interesting places in Japan since once it was the capital of ancient independent kingdom of Ryukyu, the prosperous maritime kingdom where international trade influenced its unique culture making the island became a fascinating melting pot of local, Chinese, Japanese with some Southeast Asian touches. On invitation of my friend to see the Okinawan cherry blossom festival on February, which considered the first place to see the flower blooming in Japan, I stayed on the island for one week and had a chance to see the Gusuku sites, one of Japanese World Heritage. I have visited 5 out of 9 sites that UNESCO inscribed, the first two places were the ruins of Nakijin Gusuku and Naka Gusuku, both were Gusuku which means castle, the castle ruins were just amazing, I never ever expected to see these kind of ruins in the country liked Japan, the ruins made me think that I was looking the Inca or Maya civilization or even the great Zimbabwe ruin in Africa, they were so unique in my opinion, not only the ruins surprised me, the surroundings were just breathtaking, from the castles I could see the beautiful turquoise coral sea of Pacific, the lush tropical forest and many of blooming cherry trees, truly a postcard perfect. As I mentioned the Gusuku I visited were ruins, both from antiquity and war especially the battle of Okinawa during WWII which destroyed almost every historical site on the island, the only place where in 1992 the Japanese restored all the war ruins to their former glory was the Shuri area, Shuri was a former capital city of Ryukyu and three of world heritage sites were in this area. The first place I visited was Sonohyan Utaki Stone Gate of the sacred grove, it was just a small stone gate that located next to the main road hardly notice its importance. The gate is still considered as a sacred shrine and during my visit I saw a couple of locals offered fruit and did some ritual thing. The main focus of Shuri area was Shuri Castle which was a royal palace of Ryukyu monarch, the castle was fully restored with many beautiful ceremonial gates and the royal residence complex, giving a great idea what other Gusuku should be look liked in ancient time. The castle exterior was built in Chinese style, especially the throne hall; however the interior was similar to Japanese one, the castle museum was also interesting and the replica Ryukyu throne was just amazing and my favorite was the cultural show of Ryukyu dance, the dancers were all graceful; however, visiting Shuri castle was liked visiting a theme park, everything were so superficial and set up for tourists, I did not think I enjoyed Shuri after I have seen other two fascinating and authentic Gusuku places. The last place was Tamaudon or the royal mausoleum, this place located not far from the popular Shuri castle, but Tamaudon was totally a different world, this complex was so quite and peaceful with the very interesting exhibition on ancient Ryukyu royal funeral as well as many photos of pre-war Shuri. After visit Mainland Japan, South Korea and China in consecutive years, visiting Okinawa to see Ryukyu Kingdom was a gap filling of my East Asian comparative travel study, visiting Okinawa and its Gusuku sites gave me another version of Japan and this regional culture, the island may not offered the ideal Japan that people want to see, but it has its own characteristic and charm that deserved to be praised and visited and in my opinion another great world heritage site. I visited the WHS in Naha in September 2009. Sonohyan-utaki Ishimon is a stone gate opposite the stairs that lead up to the Shuri Castle entrance. It is easily overlooked as Shureimon, the main gate to the castle, right next to Sonohyan-utaki Ishimon is more of an eye-catcher. Admission to the gates is free. The main hall of Shuri Castle was undergoing some renovation i.e. half of the main hall was hidden behind a scaffold. The entrance fee was 800 yen. The fee also gives you access to the excellent museum (English text available). 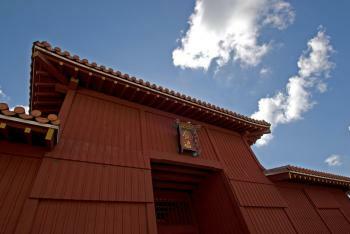 One should know that Shuri Castle is a reconstruction of the original castle which was destroyed in WWII. 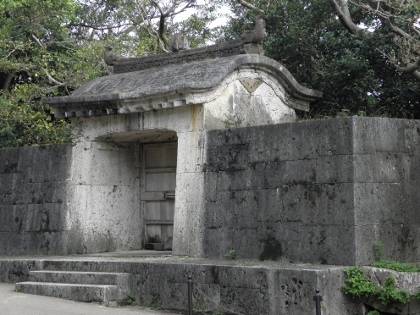 Tamaudun: This mausoleum is a short walk west of the Shuri Castle site. For a small entrance fee one gets access to the venue and to a small museum. Note that there are no English descriptions in the museum. Shikina-en, the royal gardens about 2 km south of the Shuri Castle site, offer an interesting mixture of Japanese layout, Ryûkyûan architecture, and Chinese elements. Don’t expect a fancy Japanese garden. Simplicity prevails. I visited the Gusuku Castle Ruin in Kitanakagusuku, Okinawa on 29 Oct 05. The fee for adults was 300 yen. The castle ruins itself is impressive. There is some restoration still taking place, but the fee is well worth it. On the same day of my visit, a friend accompanied me. He and I also planned on checking out the "haunted" hotel. We had brought flashlights and were prepared to thoroughly investigate the nooks and crannys of the hotel. We visited on a sunny day, so we didn't need to use the flashlights that much. Before visiting we made sure that we had new batteries, just to make sure. We were standing inside a hallway, which seemed to be an entry way from the hotel's access road to the upper tier and lookout. Across the street from where we were standing there is one tomb that had the cement block removed and a cave that was cemented and had a small shrine in front. As my friend and I were talking, his flashlight quickly went from shining brightly to nothing. It was as if the power had been drained from it. He had a small pocket flashlight as a backup, which he pulled out and it too began to have a power drain. Seeing this I turned on my flashlight and it was fine. He swore to me, with a look of astonishment, that the batteries in both were new. It was at that point that he took out his cell phone and began recording. I asked "is there anyone here with us"? We both stood still and waited...nothing. He again clicked on the record button and I askted the same question. Again, nothing. We proceeded with our walk through the hotel up to the look out point at the very top. The view was incredible. I intend to go back and take many photographs. Later after we had left the site. My friend had emailed me the audio clip that he had recorded. He said listen to it and tell me what you think. Upon listening to it, I heard my voice asking the question, silence and then what sounded like someone took to steps. The funny thing is that my friend and I had not moved during the recording? Not sure what to make of it, although I intend to go back, with a digital camera and recorder to check it out more thoroughly next time. The gusuku castle sites are certainly a must for anybody interested in visiting castles, castle ruins - in particular, Japanese castles. Shuri Castle is quite impressive, although it's just a copy of the original that was lost to WWII, it's one of the most beautifullest places on the island of Okinawa and certainly is a gem. 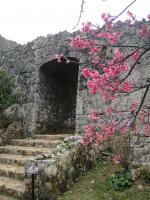 The other castles such as Nakagusuku and Nakajin and Zakimi are ruins and are worth also the visit. Nakagusuku castle ruins are also known as the "haunted castle" and the ruins are beautiful. You can walk around the castle grounds and view the surroundings and scenery. Next to the castle ruins are the modern ruins of the haunted hotel that was burnt over 20 years ago which remains intact. A walk up to the viewing tower of the hotel will give you a spectacular view of the island's western side and castle grounds. To better experience the haunted feeling of the Nakagusuku and the haunted hotel is at night (bring a flashlight). Nakajin Castle and Zakimi Castle have beautiful views as well when you stand on their walls. Ossuary: Tamaudun, royal tomb, according to Ryukyuan tradition, the royal remains would only be kept in central compartment for a limited time, after which the bones were washed and entombed in the north and south compartments - so technically it is also an ossuary. Sundial: At Shuri Castle. The sundial displayed high noon and the hours before and after that. A water clock was used by the Ryuykyans to tell the more precise time. Fusion: "cultural interchange between South-East Asia, China, Korea and Japan, and this is vividly demonstrated by the surviving monuments"
Built in the 12th century: Katsuren Castle, built in the 12th-13th centuries, is the earliest among this group of castles. Role of Women: Sefa Utaki was run by priestess called Kikoeogimi and her female staffs.